Hal-le-freakin-lujah. I finally finished this book after how many months? First attempt : March 2012Second attempt : August 2012Can you really blame me when I had this book's ending spoiled for me way back when it was first released? 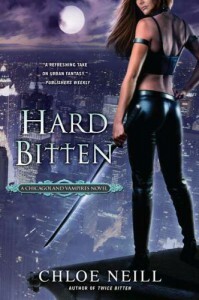 I ended up reading Hard Bitten in 3 separate parts because my motivation was stolen, given the fact that I knew what was up ahead.Since then I've had books 5 and 6 spoiled for me, so I really should either quit reading this series, or get caught up so I can read the next book the second it comes out in order to avoid being spoiled again. *shakes fist at the sky* FOILED AGAIN BY THE UPDATE FEED!Eh, what do I do? I suppose I'll continue. I loved this series when I first started reading it. Maybe the mojo will come back if I actually sit down and read a book cover to cover in one sitting.